Rider named USEF Equestrian of the Year. FORT WORTH, Texas – On Saturday, January 22, in Lexington, Ky., the United States Equestrian Federation (USEF) announced the winner of their Horse of the Year award—the organization’s highest honor. 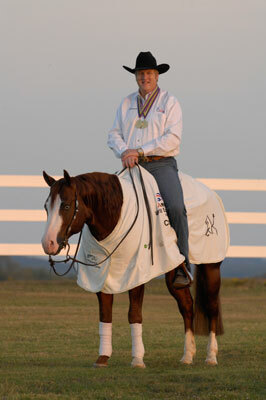 The award was given to American Paint Horse Colonels Nite Special, the only multiple gold medal-winning horse for Team USA at the 2010 Alltech FEI World Equestrian Games™, held September 25 through October 10 at the Kentucky Horse Park in Lexington. This 6-year-old reining superstar helped Team USA win the team gold medal by the largest margin in history, then returned to win the individual gold medal. The other four horses in contention for the Horse of the Year award were the elite of their breeds, dominating their disciplines as well. Colonels Nite Special (registered AQHA as Gunners Special Nite) is owned by Sarah Willeman of Turnabout Farm in Gloucester, Ma., and was ridden by Tom McCutcheon of Aubrey, Texas. Willeman purchased the horse shortly before the July 2010 selection trials for the World Equestrian Games. The young stallion was ridden by McCutcheon in the selection trials in July 2010 and was named the Reserve USEF National Champion and runner-up in the trials. During the four days of NBC’s reining coverage at the World Equestrian Games, Colonels Nite Special and McCutcheon demonstrated reining to a worldwide audience. In a fitting tribute to this exceptional team, rider Tom McCutcheon was named the 2010 USEF Equestrian of the Year. McCutcheon has piloted many horses to big wins in reining competition, culminating in the two gold medals at the World Equestrian Games. McCutcheon has competed at the World Equestrian Games and other FEI competitions in Germany, Italy and Spain since 2002, earning gold and silver medals for Team USA. He has served on the USEF Board of Directors since 2005, serving as a proponent of reining in international competition. The USEF Horse of the Year award is the top equine honor across the span of equine breeds and equestrian disciplines governed by the USEF. To find out more about USEF and the Horse and Equestrian of the Year awards, please go to usef.org. Currently, American Paint Horses are being registered at APHA’s Fort Worth, Texas, headquarters at a rate of more than 30,000 horses each year. APHA has registered more than 981,000 horses in 59 nations and territories since it was founded 49 years ago, and now serves approximately 85,000 active members around the world. APHA, a non-profit organization, prides itself on community involvement and educating the public about the beauty and talent of the breed. Among its many activities, APHA works to preserve bloodlines and maintain the outstanding characteristics of Paint Horses. For more information, visit the Association’s website at apha.com or call (817) 834-APHA (2742).